“Then the Lord rained brimstone and fire upon Sedom and Gomorrah…but [Lot’s] Wife looked back and she became a pillar of salt.” – Genesis 19. For thirteen years, this title was held by Iran’s Cave of the Three Nudes (3N) on Qeshm Island. 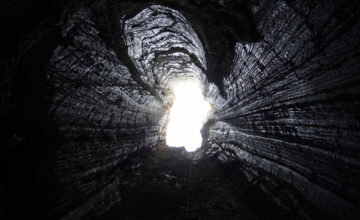 Now, an international expedition led by the Hebrew University of Jerusalem (HU)’s Cave Research Centre (CRC), Israel Cave Explorers Club, and Bulgaria’s Sofia Speleo Club, along with 80 cavers from nine countries, has successfully mapped the Malham salt cave in the Dead Sea’s Mount Sedom which, at 10 kilometers long, now bears the title of world’s longest salt cave. The international cave expeditions that worked together to map Malham Cave include Israel’s Cave Explorers Club, HU’s Cave Research Centre, and Bulgaria’s Sofia Caving Club & Speleo School. The survey team included cavers from Israel, Bulgaria, France, United Kingdom, Croatia, Romania, Germany and the Czech Republic. Registered charity number 209691. Registered company number 06350828.